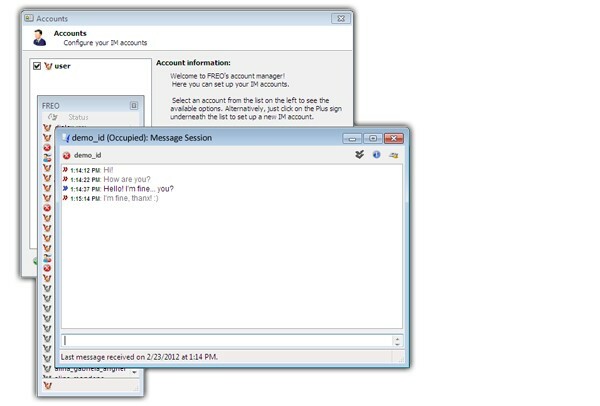 If you're looking for the most user-friendly instant messenger client to talk instantly in real-time using the Internet, Freo is one of the best options available - a totally free and clean Windows multi-capable instant messenger client. With this free download you will be able to chat with friends, make free voice calls, share a webcam, listen to online radio station and share files. Freo Messenger stores a plethora of great features (all you would expect from an IM program like chat, photo sharing, custom skins and chat transcript archives.) designed to create an enjoyable communication experience - a wonderful way to keep in touch with friends, family and colleagues. The program comes with support for AIM, ICQ, IRC, MSN and Jabber; additionally it provides a plug-in system that allows you to include other popular instant messaging protocols such as Gadu-Gadu, Yahoo, Netsend, Skype, and more which make it virtually an all-in-one messaging app. Its user-friendliness doesn't stop here - Freo Messenger was developed also for portability, it lets you run it from a USB flash drive or other similar removable storage tools but also gives you the possibility to use additional features such as Clock, Weather and RSS Feed Reader. Freo has also the advantage of little resource consumption while offering speed and numerous options. 2013-08-29 2.5.0 Faster connection speed. Performance enhancements.